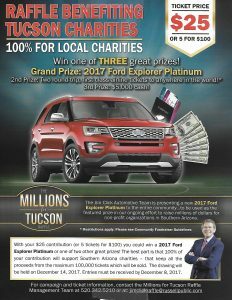 Eastside Neighbors Volunteer Program (ENVP) is currently involved in the 2017 Jim Click Millions for Tucson Raffle. The tickets are $25.00 each or 5 for $100.00 and ENVP keeps ALL of the proceed for the tickets we sell. If you are a volunteer and want to sell some tickets or purchase some tickets or if you are just some one that wants to support a good cause and maybe win a BIG RED TRUCK! contact Shelly at ENVPcares@gmail.com. 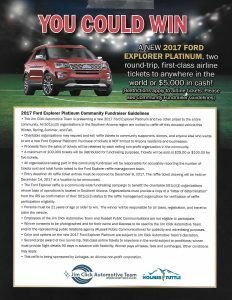 We are a non profit organization which relies on fundraisers and donations and this is a great way for us to fundraise, so we can continue to provide our services to our seniors. If you can support us with this project, we would greatly appreciate it.